Whether you’re a clothing company looking to spread the word about a new line or a restaurant debuting a seasonal menu item, garnering attention for your brand often involves looking beyond traditional media outlets and reaching out to another group of influencers: bloggers. Unlike traditional media, bloggers have a niche following that is hyper-specific to a certain region or topic (e.g. food), and they typically boast large social media audiences that consist of followers who have a vested interest in said topic. 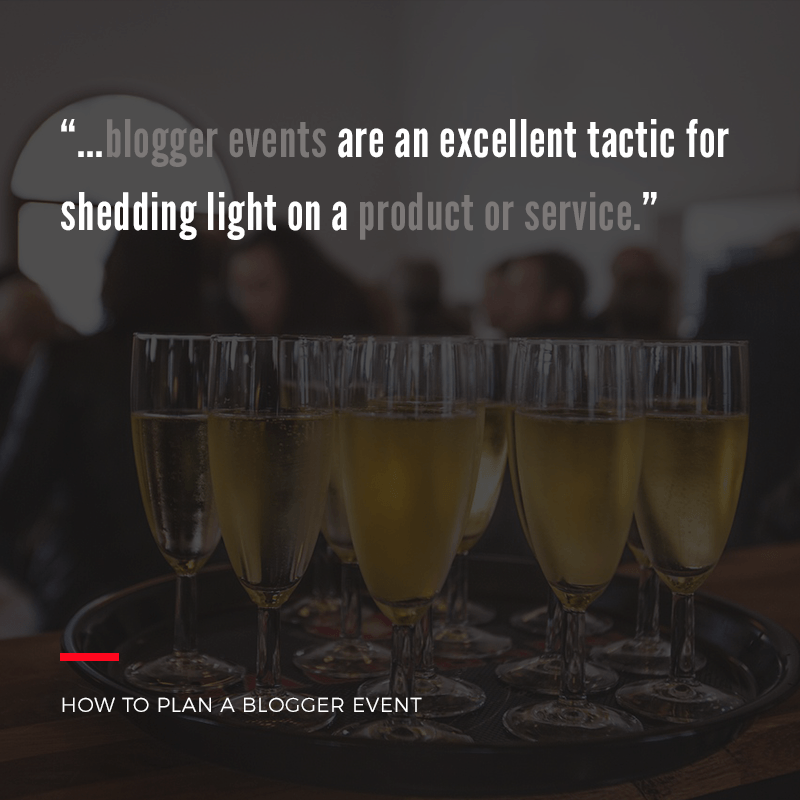 For these reasons and more, blogger events are an excellent tactic for shedding light on a product or service. So, how do you plan one? While it is always a good idea to enlist the help of an expert when planning and executing your next blogger event, here are a few key elements for creating the perfect event. Create a Targeted Blogger List: Similar to building traditional media lists, finding the right bloggers for your event means spending a good deal of time scouring Google and browsing social media. While this step may seem straightforward, it is essential to remember that not all bloggers in your city – or even all bloggers covering a particular topic – are a good fit for your event. When searching, always take the time to read recent blog posts, check a blogger’s social media credentials, and review how often a blogger posts before adding them to your list. The last thing you want is to give a spot away to someone who won’t move the needle for your brand! For the popular Tex-Mex restaurant, Tijuana Flats, we were tasked with drumming up attention for their exciting, new “Flat Outrageous” menu. Considering that they have a substantial presence in multiple markets across the Southeast, we created a vetted blogger list of foodies, mommy bloggers and around-the-town bloggers in Raleigh, Jacksonville, Orlando, Tampa, North Miami, Charleston, Savannah, Charlotte, Columbia and Winston-Salem (all cities home to Tijuana Flats restaurants). Decide on a Theme: This doesn’t necessarily mean you need to transform your event space with thousands of dollars worth of decorations, but it might! The theme of your event is an important aspect in getting bloggers to show. For example, hosting a tasting at your restaurant to showcase a new menu item is great, but hosting a “Summer Menu Preview” with wine pairings from a local vineyard is even more enticing. Planning blogger events around seasons, holidays, or even brand-specific initiatives establishes a theme and gives event attendees something to talk (and blog) about. Following our Tijuana Flats example, we crafted the theming for this event largely around the brand’s strong, highly playful persona that is all about embodying an attitude as bold as their flavors. Create a Hashtag: Optimizing your blogger event to the fullest means reaching a blogger’s audiences across all platforms, including social media. The goal of a blogger event should never just be a one-time write-up from attendees; instead, create a hashtag so attendees can share their experiences in real-time on social media, and so your own social media audience can follow along. There are many strategies involved with hashtag creation and implementation, but a hashtag for your blogger event should be creative, related to your theme or company, and relatively short (you don’t want bloggers using up all 140 characters on the hashtag and leaving no room to talk about the event itself). According to SproutSocial, tweets with hashtags receive 55% more retweets and twice as much engagement as tweets without, meaning most any professional blogger is utilizing them. Make sure your official hashtag is in their mix. For our Tijuana Flats blogger event, we promoted the brands’ #FlatOutrageous hashtag to ensure all media attention, and fan interaction, could be easily followed and built around the new menu items. Offer an Incentive: Events surrounding food or free experiences typically offer enough of an incentive to get bloggers to attend, but other initiatives may be trickier. Depending on your end goal and what you’re promoting, incentivizing attendees is the best way to receive a high number of RSVPs and glowing post-event reviews. As you may expect, Tijuana Flats’ incentives came in the form of delicious dishes straight off of the Flat Outrageous menu, available to sample at the guests’ leisure. Ensuring all of the offerings were top-notch was extremely important, as this first impression was definitely one that counted. Communicate, Communicate, Communicate! : Sending an initial invitation doesn’t mean you’ve done all you can do to get a blogger to your event. Following up with those who have not RSVP’d, in addition to those who have RSVP’d, is an important step in ensuring that all your targeted bloggers attend your event. We communicated with bloggers before, during and after the event, ensuring they had everything they needed to accurately write their articles and share their experiences on social media. While planning a blogger event can seem overwhelming, following this criteria can help alleviate the anxiety surrounding RSVPs and event plans, while also resulting in targeted, positive coverage for your brand or initiative.